The American Civil War was primarily fought with rifled muskets and saw the introduction of repeating rifles, revolvers and breech loaders. As such we have decided that it is time to program a more advanced shooting system to really showcase the main focuses of this game. In its core the system is still the same, the player aims, fires his gun and he can not move when reloading. In action though, there will be a lot more going on than simply pointing and shooting! With the introduction of repeating rifles and revolvers, the player now has to hold the right mouse button to aim and fire by tapping the left. Holding down the left mouse button while aiming will empty the magazine of the players revolver or repeater as quickly as possible, though of course, more careful shooting is recommended. Reloading is initiated by pressing "R" which makes it possible for the player to aim when not loaded. Though you might be disappointed if you have not been keeping track of number of shots fired... Reloading is done in stages, so if a player cancels a reload that is half way done, he does not have to start all over again. Revolvers can be reloaded shot by shot. Originally we intended to have the player go to "ready" before going to aim, however that made the game feel too unresponsive. As such we decided to speed up the animation by cutting out the 2nd movement of "ready". The player is now able to aim immediately after the first movement, starting to look down the barrel of their gun as they pull back the hammer. We have also added the ability to slightly shift your aim to the left or right by pressing Q and E. Often this is achieved by moving the player's upper-body from side to side, we wanted to do something a little different. We are doing a step to the right or to the left instead, this is accurate to the period and fits the historical drill manuals. It will not only make it possible to shoot around corners, but will also make it a lot easier to fire in two ranks or to oblique fire. Additionally we have added a check for collisions, so if a player is standing to close to an object, he will not be able to aim and has to move back before trying to line up another shot. Bullets no longer leave the gun at random angles like some horribly inaccurate laser rifle as you might have experienced in earlier games of this period. Your shot will now fly in accordance with an advanced ballistics system we have been working on, which realistically simulates real life bullet physics. Artillery and small arms will also both use the same system. In real life there is no difference between a smoothbore cannon and a smoothbore musket, they both fire a ball of lead at high speeds and are both subject to the same laws of physics, a cannon can simply haul more lead through the air at once. Each weapon has unique settings for muzzle velocity and twist rate. A muzzle velocity deviation setting can be used to represent larger or smaller touch holes through which pressure can escape and make the gun less reliable (think flintlocks, for example). There is a random firing delay, that can be changed for each gun. Flintlocks will have a significantly longer delay than percussion rifles. Each gun also has a unique range of loadable ammo. With over 100 unique weapons currently implemented in the game, each with their own gameplay, it will take some time for the player to get known to all of them. In the game the player will be able to choose what ammo he wants to load and pick up different types of ammo. Ammo will be dropped in packs or in single cartridges, just like they were issued back in the day. There are ammo crates which can be used to restock ammo, these ammo crates can be transported around and will be very useful for regiments that are in longer firefights. In addition to that, ammo has a muzzle velocity modifier to represent quality of the ammunition. High quality ammunition does not modify the muzzle velocity, but low quality ammunition might lower it randomly and make the rifle less reliable. Each type of ammunition refers to a projectile, this is the bullet that leaves the barrel when fired. Bullets all have proper graphics and will visibly (to the more keen eyed amongst you) fly through the air in the game. Projectiles have many variables which are modeled by our ballistics system, such as drag coefficient, size and weight. When a projectile is fired, it spawns at the tip of the barrel and the system then calculates a trajectory, using the above settings as a base. It will also look for the local humidity, temperature, air density, gravity, wind direction and wind strength plus some other factors. Taking all of this into account, our system creates a fairly realistic bullet trajectory. The unique settings on each gun mean that all of them will perform differently, guns with a higher twist rate will be more accurate than guns with a lower twist rate. Smoothbore guns are therefore much less accurate on long ranges than rifles, but both smoothbore and rifled guns will still be deadly accurate on short distances. 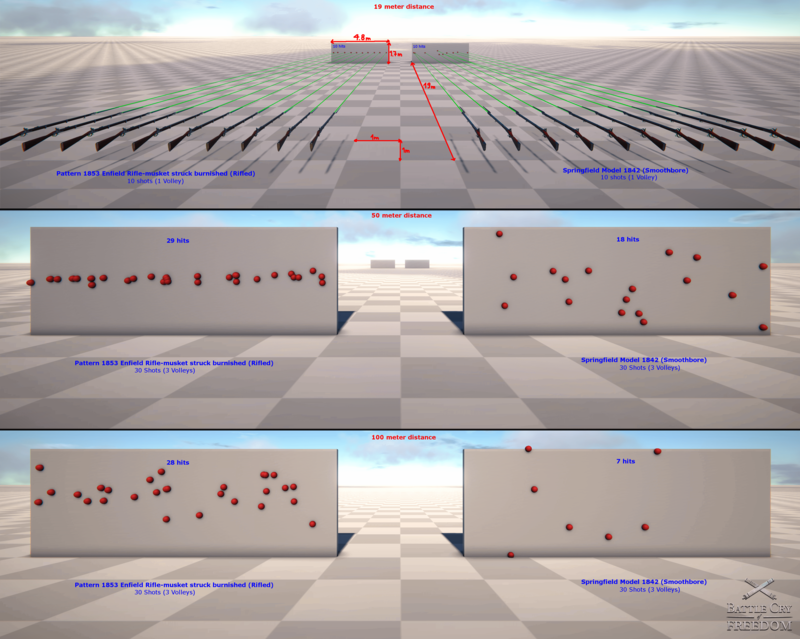 As you can see on the screenshots of our testing range above, accuracy of guns gets increasingly worse the further away the target is. Accurate long range shots become impossible with smoothbores, but rifles also loose a lot of their accuracy. All of the above is without any aiming sway, with that added into the mix, the player will quickly notice that accurately shooting long distances will require much more skill, experience and also a little bit of luck. Click on the image above to see a higher resolution copy of it. Additionally, upon impact with an object, the system checks whether the bullet will get stuck in, ricochet off, or pass through the object. Should it be able to pass through or ricochet, the system will calculate its new trajectory and velocity and keep going. Passing through and ricocheting is heavily Dependant on the impact angle and force. Larger calibers will have a much easier time passing through objects than smaller ones (Assuming they are traveling with the same velocity). Damage delivered to players or objects is equal to the velocity lost upon impact, multiplied by the size and weight of the projectile. Bullets no longer leave the gun at random angles like some horribly inaccurate laser rifle as you might have experienced in earlier games of this period. Looks cool! Keep up the good work! Wanna know what a wug is? Read here! 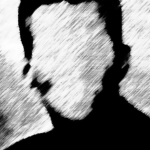 Juice_Kelly: no one wants to be savs, he's the biggest firegiant on the server. I have one question, I've been away from this forum and game for a while, I played "that other ACW online FPS" and wonder if BCF will be more user friendly as I'd like to call it, with lower graphical requirements so I don't have to buy a new computer, that other game was soooo slow, yes graphics were good but I'd rather play a smooth, fast and fun ACW game with not the best graphics available. If so then I'm in and will support this game. Good boy, this looks really promising and actually quite polished. I like the feeling of shooting by the looks of it already, the whole movement looks smooth and the shot itself as frightening as it should be, especially with the revolver. One can really see and probably feel the power that is unleashed by pulling the trigger, much better than in many other shooters where it just doesnt get the edge. It's quite obvious that you actually know out of own experience what you're trying to achieve and I think that you're on a great way of getting to that goal. Bravo to you! That being said, we have not really tested on older machines yet as our machines are usually above average-average. That's why we will need testers soon, so that we can test it more carefully. We are offering the player to change ANY settings that we can expose so hopefully that will help in getting the game both run and look as you personally like it. I think FSE just made a 2000% increase in their blog posts within the span of a month. That won't work, as in firing mode the left mouse button is reserved to firing now. Just like right mouse button is reserved to aiming. That's the reason you can now dryfire. It also makes using repeaters easier and more straightforward. Thank you for the quick reply, I don't have an old machine but I was so disappointed with "that other game", the graphical engine was so heavy everything felt like it was in slow motion even with my relatively new machine and on lower settings. Also I love that you're planning out not just one battle but many. So how frequent are these blogs going to be? Quite honestly anyone I have spoken to agree that the last one should really have just been an add on to one like this. We will post a bunch more of these and after that we should have covered most of the important stuff that is in the game at the moment. We will then instead go over to posting a blog every week or every 2nd week (not yet been decided) about our most recent progress and what we have done in our twice weekly meetings/tests. Those blogs won't necessarily be long or very interesting, but they will keep everyone up to date about what is going on.